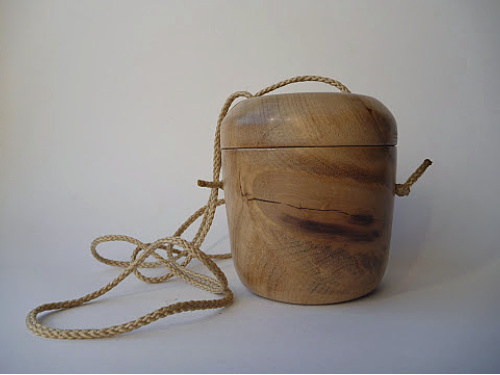 Japanese wooden bait boxes (esa bako) are as beautiful as they are functional. I suppose all endeavors have their share of paraphernalia - the bits and pieces of gear you need to do what you are doing. In tenkara, we are told you only need a rod, a line and a fly. In keiryu fishing (at least in the Japanese style, fishing with bait) you also need a bait box. 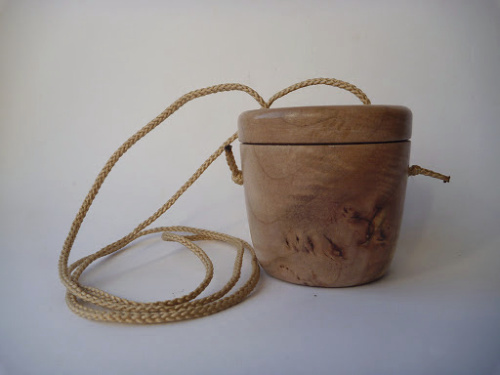 The bait boxes used by Japanese keiryu anglers range from simple utilitarian plastic bait boxes that clip to your wader belt all the way to intricately hand carved or hand painted wooden boxes that are truly works of art. Simple need not be utilitarian. It can be artistic and beautiful as well. 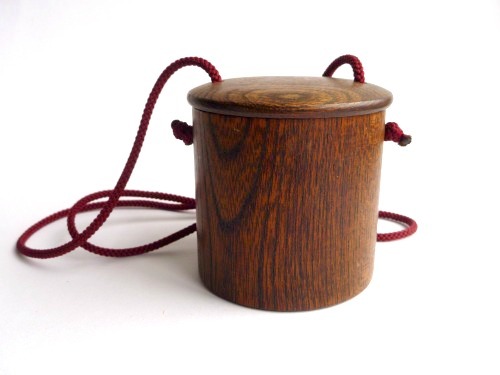 Traditional wooden bait boxes are worn around the neck. The cord runs through the lid so the lid can't be lost. The lid is held closed by a combination of gravity and friction. On one of my wife's visits to my supplier's shop in Japan, she saw the simple wooden bait box shown above. With the wonders of Apple's Face Time feature (the "video phone" that futurists had forecast for the last 50 years), she showed me the box and I bought it on the spot. A customer, Les Albjerg, got interested (and then excited) about keiryu fishing - to the point that he started a worm farm (worm fishing for trout is extremely effective). 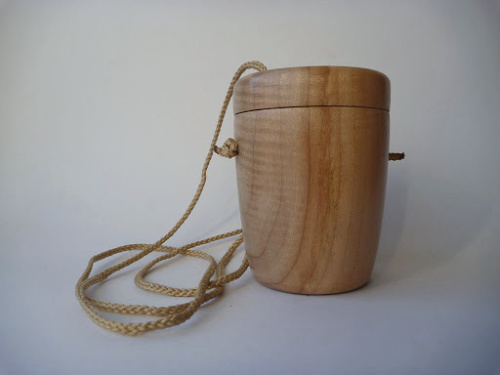 About the same time, Jared K stated on his "Your Keiryu Stories" submission that he wanted one of the wooden Japanese bait boxes. Les asked about the boxes so I sent him a photo. He got excited again. 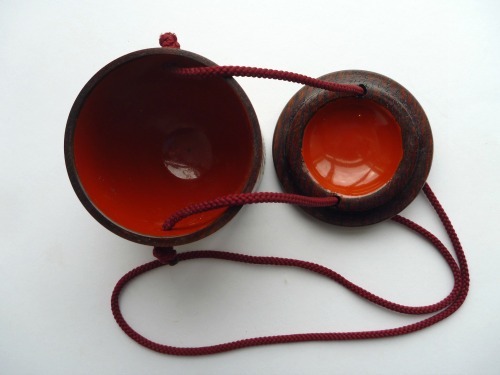 As it happens, he is a woodworker who has learned the Japanese method of wood turning. He currently makes duck and goose calls, and tampers for espresso machines (to make it right you have to have one). He contacted me and offered to make traditional Japanese wooden bait boxes. It did not take me long to say "yes." Les makes the boxes from myrtlewood or big leaf maple, hard, light weight woods that are ideal for bait boxes. 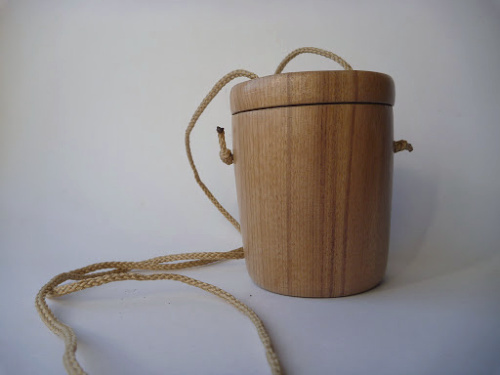 The wood has an interesting grain, and Les makes the bait boxes so the grain in the lid is a continuation of the grain in the lower part of the box. Each one is a bit different but most are a bit over 3" tall and a bit under 3" in diameter. The inside of the box is finished with a clay pigment. 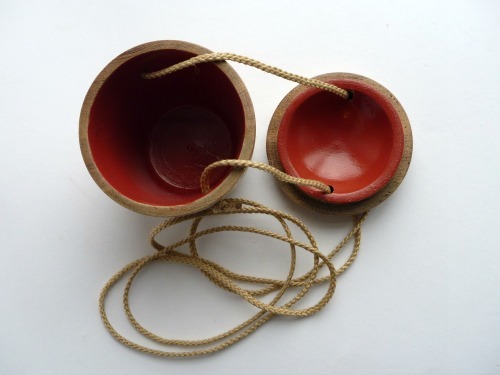 The early Japanese wooden bait boxes were finished with a clay pigment before they started using lacquer. (Besides being highly toxic, traditional Japanese lacquer is not available in the US anyway.) The outside of each box is finished with a urethane that will stand up to the elements. Use the box for red wigglers, wax worms, meal worms, salmon eggs, nymphs taken from the streambed (where legal) and kept moist with damp moss, etc. I've seen videos of Japanese anglers with more than one bait box, so they can carry more than one type of bait. I hope you'll get as excited about keiryu fishing as I am (and as Les is). I also hope you'll try one of his bait boxes. You will need a bait box. May as well have a traditional wooden bait box that is as attractive as it is functional. Boxes #2 and #3 are Myrtlewood. Boxes #4 - #5 are Big Leaf Maple. Box #4 is shorter than the others, at just under 3" tall.